A Swedish Internet company linked to file-sharing hub The Pirate Bay says it's helping online whistle-blower WikiLeaks release classified documents from servers located in a Stockholm suburb. Mikael Viborg, the owner of the Web hosting company PRQ, on Friday showed The Associated Press the site - the basement of a drab office building - in Solna on the condition that the exact location was not revealed. "This is the office. 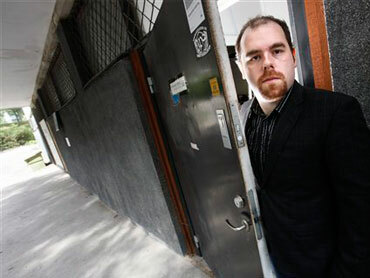 The server room is further inside," the 28-year-old Viborg said, with the door to the office cracked open. Desks with computers, documents, and empty pastry boxes and soda cans could be seen inside before he closed the door. The secretive website gives few details about its setup, but says its "servers are distributed over multiple international jurisdictions and do not keep logs. Hence these logs cannot be seized." Viborg said WikiLeaks has servers outside Sweden, too. "There are backups," he said. "If one goes down, there are others that take over." Viborg said he was comfortable revealing the location in Solna because Swedish authorities already know where it is and have not tried to shut down the servers. "Not so far," Viborg said. "First I thought it was a bit surprising. But when you look at the legal situation it's hard to see that Swedish authorities can tell us to do anything, legally. "They can ask us to do it out of goodwill, but I can tell you right now that we won't oblige." Swedish Foreign Ministry spokesman Anders Jorle said the government had not been contacted by the United States about the WikiLeaks servers and had no plans to get involved in the matter. Any decision to intervene would have to be taken by Sweden's justice system, he said. Sweden's staunch protection of the freedom of expression has made it a sanctuary for websites carrying politically sensitive information. PRQ, in particular, has eagerly offered its services to controversial websites, citing its "boundless commitment to free speech." The company has come under fire for hosting a Chechen rebel site and the Pirate Bay. The founders of that site, popular among file-swappers, were sentenced to one year in prison by a Swedish court in 2009 after being convicted of helping users violate copyright laws. WikiLeaks recently posted a huge encrypted file named "Insurance" to its website, sparking speculation that those behind the organization may be prepared to release more classified information if authorities interfere with them. Viborg, a goatee-sporting Swede with a law degree and self-taught computer skills, said he didn't know for sure whether that file was hosted on the servers in Solna, though he added that "I assume it is." He said PRQ had worked with WikiLeaks since 2008, but always through a Swedish middleman instead of direct contacts. PRQ doesn't own the WikiLeaks servers in Solna, but provides the Internet service, electricity and other services, including restarting the servers when needed, he added. PRQ treats Wikileaks like any other client, Viborg said, but admitted he has personal sympathies for the website. "The freedom of expression and the transparency that is required in a democratic society, I think they are important," he said.